Global Commercial Aircraft Disassembly, Dismantling & Recycling Market report covers both the revenue generated from Dismantling and Disassembly services and the market for the salvaged components. The market forecast for the services and components are covered separately in the Market Forecast section. The current market for dismantling services is estimated at around USD 97 Million and is expected to grow at a CAGR of around 6%-7% and reach around USD 180 Million in 2027. The market for salvaged components is estimated at USD 1.30 Billion in 2018 and is expected to surpass USD 3 Billion by 2027. The key challenge in this market is the aircraft valuation which is more of an estimation than a formula. An APU from two similar aircraft manufactured in the same year could fetch different prices if one of the aircraft has been scrapped due to an accident. The second challenge is the aircraft demand in the market, if there are good number of aircraft which are stored in the specific model, the demand is naturally lower. The drivers are the increasing passenger number which is driving the need for fuel efficient, dense and reliable aircraft platforms. This has driven this market in North America and Europe, the air travel market in APAC is expected to grow at the fastest growth rate. 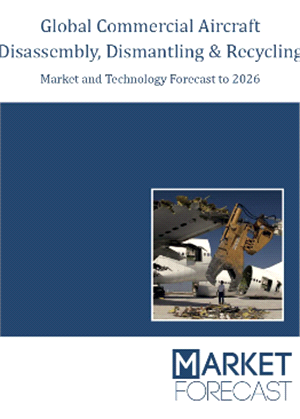 The report “Global Commercial Aircraft Disassembly, Dismantling & Recycling Market to 2027” provides two years historical data and the forecast until 2027. The forecast is also considered for two other scenarios taking into account the various factors which are expected to shape the market. Overview and Market Trends: This section covers the ongoing major commercial aviation programs, the global aircraft deliveries, passenger traffic and freight growth which are the overall stakeholders in the market. The next section deals in detailed with the stakeholders and their role in shaping this market. Market Dynamics & Market Share Analysis: This section of the report deals with the key drivers, restraints and challenges of this market. This sections also covers the market share analysis and forecast. The forecast scenarios based on various market factors has been covered in this chapter. Aircraft Storage & Retirement: In this section the various End of Life solutions and the region wise trends are covered. Model wise retirement overview is also covered in this section, around 40 individual programs have been considered and a detailed analysis has been covered in this chapter. Factors affecting the criteria for storage: The airline does not always decide to store an aircraft due to the age of the aircraft. In some case fleet planning could be one of the reasons for the temporary storage of the aircraft. The possibility of an aircraft to return to active flying after 3 years of storage is very less. The factors which affect the factors the airlines consider for selecting a storage facility are covered in this section. Market Forecast: This section covers the market forecast of this market, the forecast in this report has been done for the Aircraft Disassembly, Dismantling & Recycling Service market and the components. The services have been segmented as regional and aircraft wise (narrow body, small aircraft and wide body). The components forecast has been segmented into six segments. Opportunity Analysis: The sector which has the maximum opportunity across the forecast segments have been discussed in detailed in this segment. Company Profiles: Most of the major companies involved in Aircraft Disassembly, Dismantling & Recycling Market have been covered in the company profiles section. The report covers Small Aircraft, Narrow Body and Wide Body and around 40 programs have been covered in detailed. The report features more than 100 tables and 90+ figures. The report has been segmented based on the aircraft type, region wise and components. Each of these segments have aircraft numbers and the revenues. Scenario analysis has been done based on key market factors which would affect the market like the change in oil prices. A detailed PESTLE analysis has also been done for the market in a separate section. A clear impacts on the market based on the changing external market dynamics like the oil prices and other factors like change in passenger dynamics like external events like SARS. Make correct business decisions based on thorough analysis of the total competitive landscape of the sector with detailed profiles of the Global Commercial Aircraft Disassembly, Dismantling & Recycling Market providers around the world which include information about their products, alliances, recent contract wins and financial analysis wherever available. 12.6 KLM UK Engineering Ltd. Single User License: This license allows for use of a report by one person. This person may use the report on any computer, and may print out the report, but may not share the report (or any information contained therein) with any other person or persons. Unless a Departmental License, a Site License or a Global Site License is purchased, a Single User License must be purchased for every person that wishes to use the report within the same enterprise. Customers who infringe these license terms are liable for a Global Site license fee. 5-User License: This license allows for use of a report by five people within the same enterprise location. Each of these people may use the report on any computer, and may print out the report, but may not share the report (or any information contained therein) with any other person or persons. Customers who infringe these license terms are liable for a Global Site license fee. Site License: This license allows for use of a report by an unlimited number of people within the same enterprise location. Each of these people may use the report on any computer, and may print out the report, but may not share the report (or any information contained therein) with any person or persons outside of the enterprise location. Customers who infringe these license terms are liable for a Global Site license fee. Global Site License: This license allows for use of a report by an unlimited number of people within the same enterprise worldwide. Each of these people may use the report on any computer, and may print out the report, but may not share the report (or any information contained therein) with any other person or persons outside of the enterprise. Note: For delivery of sample pages you must have a Domain Specific Email ID, normally your business email address complies. Generic Email IDs such as AOL, Hotmail, Yahoo, Gmail, MSN etc. are not accepted.